Type I reactions (ie, immediate hypersensitivity reactions) involve immunoglobulin E (IgE)–mediated release of histamine and other mediators from mast cells and basophils. Examples include anaphylaxis and allergic rhinoconjunctivitis. 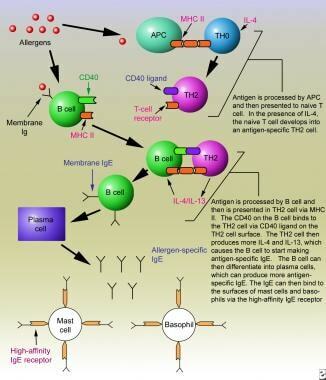 Type II reactions (ie, cytotoxic hypersensitivity reactions) involve immunoglobulin G or immunoglobulin M antibodies bound to cell surface antigens, with subsequent complement fixation. An example is drug-induced hemolytic anemia. Type III reactions (ie, immune-complex reactions) involve circulating antigen-antibody immune complexes that deposit in postcapillary venules, with subsequent complement fixation. An example is serum sickness. Type IV reactions (ie, delayed hypersensitivity reactions, cell-mediated immunity) are mediated by T cells rather than by antibodies. An example is contact dermatitis from poison ivy or nickel allergy. This system accounts for the fact that multiple components of the immune system can be involved in various types of hypersensitivity reactions. For example, T cells play an important role in the pathophysiology of allergic reactions (see Pathophysiology). In addition, the term immediate hypersensitivity is somewhat of a misnomer because it does not account for the late-phase reaction or for the chronic allergic inflammation that often occurs with these types of reactions. The focus of this article is allergic reactions in general. Although some of the clinical manifestations listed previously are briefly mentioned, refer to the articles on these topics for more detail. For example, see Allergic and Environmental Asthma; Anaphylaxis; Food Allergies; Rhinitis, Allergic; and Urticaria. Immediate hypersensitivity reactions are mediated by IgE, but T and B cells play important roles in the development of these antibodies. CD4+ T-cells are divided into 3 broad classes: effector T-cells, memory T-cells, and T-regulatory (Treg) cells. Effector T-cells are further divided based on the cytokines they produce: TH1, TH2, and TH17 cells. TH1 cells produce interferon-gamma and interleukin (IL)-2, and promote a cell-mediated immune response. TH2 cells produce IL-4 and IL-13, which then act on B-cells to promote the production of antigen-specific IgE. TH17 cells produce IL-17, IL-21, and IL-22 to help fight extracellular pathogens, to produce antimicrobial peptides, and to promote neutrophil inflammation essential for immunity at the skin and mucosal surfaces. Memory T-cells rapidly differentiate into effector T-cells in secondary immune responses. CD4+CD25+FOXP3+ Treg cells are essential in peripheral tolerance and serve to suppress dysregulated immuneresponses.CD4+CD25+FOXP3+Tregs inhibit TH2 cytokine production through the secretion and action of IL-10 and TGF-beta. Proper function of CD4+CD25+FOXP3+ Treg cells has been shown to be important in the tolerance of allergens. Abnormalities in the CD4+CD25+FOXP3+ Treg population may play a role in the development of allergic disease. The allergic reaction first requires sensitization to a specific allergen and occurs in genetically predisposed individuals. The allergen is either inhaled or ingested and is then processed by an antigen-presenting cell (APC), such as a dendritic cell, macrophage, or B-cell. [7, 8] The antigen-presenting cells then migrate to lymph nodes, where they prime naïve TH cells that bear receptors for the specific antigen. After antigen priming, naïve TH cells differentiate into TH1, TH2, or TH17 cells based upon antigen and cytokine signaling. In the case of allergen sensitization, the differentiation of naïve TH cells is skewed toward a TH2 phenotype. These allergen-primed TH2 cells then release IL-4, IL-5, IL-9, and IL-13. IL-5 plays a role in eosinophil development, recruitment, and activation. IL-9 plays a regulatory role in mast cells activation. IL-4 and IL-13 act on B cells to promote production of antigen-specific IgE antibodies. For this to occur, B cells must also bind to the allergen via allergen-specific receptors. They then internalize and process the antigen and present peptides from it, bound to the major histocompatibility class II molecules found on B-cell surfaces, to the antigen receptors on TH2 cells. The B cell must also bind to the TH2 cell and does so by binding the CD40 expressed on its surface to the CD40 ligand on the surface of the TH2 cell. IL-4 and IL-13 released by the TH2 cells can then act on the B cell to promote class switching from immunoglobulin M production to antigen-specific IgE production (see image below). Immediate hypersensitivity reactions. Sensitization phase of an immunoglobulin E–mediated allergic reaction. Histamine: This mediator acts on histamine 1 (H1) and histamine 2 (H2) receptors to cause contraction of smooth muscles of the airway and GI tract, increased vasopermeability and vasodilation, enhanced mucus production, pruritus, cutaneous vasodilation, and gastric acid secretion. Tryptase: Tryptase is a major protease released by mast cells. Its role is not completely understood, but it can cleave C3, C3a, and C5 in addition to playing a role in airway remodeling. [11, 8] Tryptase is found in all human mast cells but in few other cells and thus is a good marker of mast cell activation. Proteoglycans: Proteoglycans include heparin and chondroitin sulfate. The role of the latter is unknown; heparin seems to be important in storing the preformed proteases and may play a role in the production of alpha-tryptase. Chemotactic factors: An eosinophilic chemotactic factor of anaphylaxis causes eosinophil chemotaxis; an inflammatory factor of anaphylaxis results in neutrophil chemotaxis. Eosinophils release major basic protein and, together with the activity of neutrophils, can cause significant tissue damage in the later phases of allergic reactions. Platelet-activating factor (PAF): PAF is synthesized from membrane phospholipids via a different pathway from arachidonic acid. It aggregates platelets but is also a very potent mediator in allergic reactions. It increases vascular permeability, causes bronchoconstriction, and causes chemotaxis and degranulation of eosinophils and neutrophils. Adenosine: This is a bronchoconstrictor that also potentiates IgE-induced mast cell mediator release. IL-4: IL-4 stimulates and maintains TH2 cell proliferation and switches B cells to IgE synthesis. IL-5: IL-5 is key in the maturation, chemotaxis, activation, and survival of eosinophils. IL-5 primes basophils for histamine and leukotriene release. IL-6: IL-6 promotes mucus production. IL-13: IL-13 has many of the same effects as IL-4. Urticaria/angioedema: Release of the above mediators in the superficial layers of the skin can cause pruritic wheals with surrounding erythema. If deeper layers of the dermis and subcutaneous tissues are involved, angioedema results. Angioedema is swelling of the affected area; it tends to be painful rather than pruritic. Allergic rhinitis: Release of the above mediators in the upper respiratory tract can result in sneezing, itching, nasal congestion, rhinorrhea, and itchy or watery eyes. Allergic asthma: Release of the above mediators in the lower respiratory tract can cause bronchoconstriction, mucus production, and inflammation of the airways, resulting in chest tightness, shortness of breath, and wheezing. Allergic reactions can occur as immediate reactions, late-phase reactions, or chronic allergic inflammation. Immediate or acute-phase reactions occur within seconds to minutes after allergen exposure. Some of the mediators released by mast cells and basophils cause eosinophil and neutrophil chemotaxis. Attracted eosinophils and resident lymphocytes are activated by mast cell mediators. These and other cells (eg, monocytes, T cells) are believed to cause the late-phase reactions that can occur hours after antigen exposure and after the signs or symptoms of the acute-phase reaction have resolved. The signs and symptoms of the late-phase reaction can include redness and swelling of the skin, nasal discharge, airway narrowing, sneezing, coughing, and wheezing. These effects can last a few hours and usually resolve within 24-72 hours. The International Study of Asthma and Allergies in Childhood (ISAAC) is an epidemiological research program that was established in 1991 to evaluate asthma, eczema, and allergic rhinitis in children worldwide. The study is composed of 3 phases. Phase 1 used questionnaires designed to assess the prevalence and severity of asthma and allergic disease in defined populations in centers around the world. Most of this data was collected in the mid 1990s. Phase 2 was designed to assess possible etiological factors based on information gathered from Phase 1. Phase 3 is a repetition of Phase 1 to assess trends in prevalence. Data from ISAAC show variations in the prevalence of allergic diseases between countries. Asthma, as with other atopic diseases, was previously increasing in prevalence. [22, 23] Data from a study from England suggest that the prevalence of asthma, allergic rhinitis, and atopic dermatitis may be stabilizing. Hospital admissions for anaphylaxis, however, have increased by 600% over the past decade in England and by 400% for food allergy. Admission rates for urticaria increased 100%, and admission rates for angioedema increased 20%, which suggests that these allergic diseases may be increasing in prevalence. The prevalence of asthma in East Germany prior to 1990 was lower than in West Germany, despite the fact that East Germany had more air pollution. Mortality from allergic diseases occurs primarily from anaphylaxis and asthma, although deaths from asthma are relatively rare. Between 2007-2009 in the United States, the asthma death rate per 1,000 persons was 0.15. The death rate was 75% higher for blacks compared to whites, 30% higher for females compared to males, and nearly 7 times higher for adults than children. Approximately 500 people die annually from anaphylaxis in the United States. Allergic diseases are a significant cause of morbidity. In 2007, $56 billion was spent on medical costs, lost school, and work days and early deaths due to asthma in the United States alone. Children with untreated allergic rhinitis do worse on aptitude tests than their nonatopic peers. The reason for the differences in the prevalence of allergic diseases with respect to race are complex and not completely understood. In the US between 2008-2010, multiracial individuals had the highest asthma prevalence at 14.1%. Next, blacks had a prevalence of 11.2%, followed by American Indian/Alaska Native at 9.4%, and whites at 7.7%. Among the Hispanic population, the highest asthma prevalence rates were seen in persons of Puerto Rican (16.1%) and Mexican (5.4%) descents. Asthma prevalence was also higher in persons with a family income below the poverty level. Thus, it is likely that differences in allergic diseases among different racial or ethnic groups is multifactorial and includes genetic, environmental, and socioeconomic factors. Some unexplained differences exist in the prevalence of allergic diseases between the sexes. Asthma is more prevalent in boys during the first decade of life;  after puberty, prevalence is higher in females. The male-to-female ratio of children who have atopic disease is nearly 2:1. Food allergies and subsequent anaphylaxis are more prevalent in children. Some children may outgrow their allergies to certain foods, or their reactions may diminish over time. However, anaphylaxis from food and other triggers is still a threat in adults. Some food allergies, such as allergy to shellfish, may last a lifetime. Gell PGH, Coombs RRA, eds. Clinical Aspects of Immunology. Oxford, England: Blackwell; 1963. Ariza A, Fernandez TD, Doña I, Aranda A, Blanca-Lopez N, Melendez L, et al. Basophil activation after nonsteroidal anti-inflammatory drugs stimulation in patients with immediate hypersensitivity reactions to these drugs. Cytometry A. 2014 Jan 17. [Medline]. Sell S, Rich RR, Fleisher TA, et al, eds. Clinical Immunology: Principles and Practice. 1st ed. St. Louis, Mo: Mosby-Year Book; 1996. 449-77. Lawlor GJ, Fischer TJ, Adelman DC, eds. Manual of Allergy and Immunology. 3rd ed. Philadelphia, Pa: Lippincott-Raven; 1995. Wu LC, Zarrin AA. The production and regulation of IgE by the immune system. Nat Rev Immunol. 2014 Mar 14. [Medline]. Nimmagadda SR, Evans R 3rd. Allergy: etiology and epidemiology. Pediatr Rev. 1999 Apr. 20(4):111-5; quiz 116. [Medline]. von Bubnoff D, Geiger E, Bieber T. Antigen-presenting cells in allergy. J Allergy Clin Immunol. 2001 Sep. 108(3):329-39. [Medline]. Adkinson Jr NF, Bochner BS, Busse WW, Holgate ST, Lemanske Jr RF, Simons FER. Middleton’s Allergy: Principles and Practice. 7th. PA: Mosby Elsevier; 2009. Middleton E, Reed C, Ellis E, eds. Allergy: Principles and Practice. 5th ed. St. Louis, Mo: Mosby-Year Book; 1998. Paul WE. Fundamental Immunology. 2nd ed. Columbus, Ohio: Primis Custom Publishing; 1999. Fukuoka Y, Xia HZ, Sanchez-Muñoz LB, Dellinger AL, Escribano L, Schwartz LB. Generation of anaphylatoxins by human beta-tryptase from C3, C4, and C5. J Immunol. 2008 May 1. 180(9):6307-16. [Medline]. [Full Text]. Brunnée T, Reddigari SR, Shibayama Y, Kaplan AP, Silverberg M. Mast cell derived heparin activates the contact system: a link to kinin generation in allergic reactions. Clin Exp Allergy. 1997 Jun. 27(6):653-63. [Medline]. Noga O, Brunnée T, Schäper C, Kunkel G. Heparin, derived from the mast cells of human lungs is responsible for the generation of kinins in allergic reactions due to the activation of the contact system. Int Arch Allergy Immunol. 1999 Dec. 120(4):310-6. [Medline]. Pearlman DS. Pathophysiology of the inflammatory response. J Allergy Clin Immunol. 1999 Oct. 104(4 Pt 1):S132-7. [Medline]. Schoenwetter WF. Allergic rhinitis: epidemiology and natural history. Allergy Asthma Proc. 2000 Jan-Feb. 21(1):1-6. [Medline]. Akinbami LJ, Moorman, JE, Bailey C, et al. Trends in Asthma Prevalence, Health Care Use and Mortality: United States, 2001-2010. Hyattsville, Md: National Center for Health Statistics; 2012. 94: 1-6. Lieberman P, Nicklas RA, Oppenheimer J, Kemp SF, Lang DM, Bernstein DI, et al. The diagnosis and management of anaphylaxis practice parameter: 2010 update. J Allergy Clin Immunol. 2010 Sep. 126(3):477-80.e1-42. [Medline]. Masoli M, Fabian D, Holt S, Beasley R. The global burden of asthma: executive summary of the GINA Dissemination Committee report. Allergy. 2004 May. 59(5):469-78. [Medline]. Janson C, Anto J, Burney P, et al. The European Community Respiratory Health Survey: what are the main results so far? European Community Respiratory Health Survey II. Eur Respir J. 2001 Sep. 18(3):598-611. [Medline]. Asher MI, Keil U, Anderson HR, et al. International Study of Asthma and Allergies in Childhood (ISAAC): rationale and methods. Eur Respir J. 1995 Mar. 8(3):483-91. [Medline]. Asher MI, Montefort S, Bjorksten B, et al. Worldwide time trends in the prevalence of symptoms of asthma, allergic rhinoconjunctivitis, and eczema in childhood: ISAAC Phases One and Three repeat multicountry cross-sectional surveys. Lancet. 2006 Aug 26. 368(9537):733-43. [Medline]. Lawson JA, Senthilselvan A. Asthma epidemiology: has the crisis passed?. Curr Opin Pulm Med. 2005 Jan. 11(1):79-84. [Medline]. Keller MB, Lowenstein SR. Epidemiology of asthma. Semin Respir Crit Care Med. 2002 Aug. 23(4):317-29. [Medline]. Gupta R, Sheikh A, Strachan DP, Anderson HR. Time trends in allergic disorders in the UK. Thorax. 2007 Jan. 62(1):91-6. [Medline]. Busse WW. Mechanisms and advances in allergic diseases. J Allergy Clin Immunol. 2000 Jun. 105(6 Pt 2):S593-8. [Medline]. Lasley MV. Allergic disease prevention and risk factor identification. Immunol Allergy Clin North Am. 1999. 19:149-59.
von Mutius E, Braun-Fahrländer C, Schierl R, Riedler J, Ehlermann S, Maisch S. Exposure to endotoxin or other bacterial components might protect against the development of atopy. Clin Exp Allergy. 2000 Sep. 30(9):1230-4. [Medline]. Akinbami LJ, Moorman JE, Bailey C, Zahran HS, King M, Johnson CA, et al. Trends in asthma prevalence, health care use, and mortality in the United States, 2001-2010. NCHS Data Brief. 2012 May. 1-8. [Medline]. Asthma in the US. Available at http://www.cdc.gov/vitalsigns/asthma/. Accessed: September 3, 2014. Guinnepain MT, Eloit C, Raffard M, Brunet-Moret MJ, Rassemont R, Laurent J. Exercise-induced anaphylaxis: useful screening of food sensitization. Ann Allergy Asthma Immunol. 1996 Dec. 77(6):491-6. [Medline]. Expert Panel Report 3 (EPR-3): Guidelines for the Diagnosis and Management of Asthma-Summary Report 2007. J Allergy Clin Immunol. 2007 Nov. 120(5 Suppl):S94-138. [Medline]. Rosenwasser LJ, Klemm DJ, Dresback JK, Inamura H, Mascali JJ, Klinnert M. Promoter polymorphisms in the chromosome 5 gene cluster in asthma and atopy. Clin Exp Allergy. 1995 Nov. 25 Suppl 2:74-8; discussion 95-6. [Medline]. Stock P, DeKruyff RH, Umetsu DT. Inhibition of the allergic response by regulatory T cells. Curr Opin Allergy Clin Immunol. 2006 Feb. 6(1):12-6. [Medline]. Cox L. Overview of serological-specific IgE antibody testing in children. Curr Allergy Asthma Rep. 2011 Dec. 11(6):447-53. [Medline]. Francis JN, Till SJ, Durham SR. Induction of IL-10+CD4+CD25+ T cells by grass pollen immunotherapy. J Allergy Clin Immunol. 2003 Jun. 111(6):1255-61. [Medline]. Label: GRASTEK- phleum pratense pollen tablet. Available at http://dailymed.nlm.nih.gov/dailymed/drugInfo.cfm?setid=1d7f3e56-c233-47a4-9bcd-80098ffff47d. Accessed: September 8, 2014. Label: RAGWITEK- ambrosia artemisiifolia pollen tablet. Available at http://dailymed.nlm.nih.gov/dailymed/drugInfo.cfm?setid=986abfaf-67fc-47fb-8c86-d9f9cce6fa8b. Accessed: September 8, 2014. ORALAIR [package insert]. Available at [Full Text]. Ruffin CG, Busch BE. Omalizumab: a recombinant humanized anti-IgE antibody for allergic asthma. Am J Health Syst Pharm. 2004 Jul 15. 61(14):1449-59. [Medline]. Davis LA. Omalizumab: a novel therapy for allergic asthma. Ann Pharmacother. 2004 Jul-Aug. 38(7-8):1236-42. [Medline]. Busse W, Corren J, Lanier BQ, McAlary M, Fowler-Taylor A, Cioppa GD. Omalizumab, anti-IgE recombinant humanized monoclonal antibody, for the treatment of severe allergic asthma. J Allergy Clin Immunol. 2001 Aug. 108(2):184-90. [Medline]. Bernstein JA, Lang DM, Khan DA, Craig T, Dreyfus D, Hsieh F, et al. The diagnosis and management of acute and chronic urticaria: 2014 update. J Allergy Clin Immunol. 2014 May. 133(5):1270-7. [Medline]. Spergel JM, Leung DY. Safety of topical calcineurin inhibitors in atopic dermatitis: evaluation of the evidence. Curr Allergy Asthma Rep. 2006 Jul. 6(4):270-4. [Medline]. Breuer K, Werfel T, Kapp A. Safety and efficacy of topical calcineurin inhibitors in the treatment of childhood atopic dermatitis. Am J Clin Dermatol. 2005. 6(2):65-77. [Medline]. Simons FE, Gu X, Simons KJ. Epinephrine absorption in adults: intramuscular versus subcutaneous injection. J Allergy Clin Immunol. 2001 Nov. 108(5):871-3. [Medline]. Simons FE, Roberts JR, Gu X, Simons KJ. Epinephrine absorption in children with a history of anaphylaxis. J Allergy Clin Immunol. 1998 Jan. 101(1 Pt 1):33-7. [Medline]. Nelson HS, Weiss ST, Bleecker ER, Yancey SW, Dorinsky PM. The Salmeterol Multicenter Asthma Research Trial: a comparison of usual pharmacotherapy for asthma or usual pharmacotherapy plus salmeterol. Chest. 2006 Jan. 129(1):15-26. [Medline]. Loymans RJ, Gemperli A, Cohen J, Rubinstein SM, Sterk PJ, Reddel HK, et al. Comparative effectiveness of long term drug treatment strategies to prevent asthma exacerbations: network meta-analysis. BMJ. 2014 May 13. 348:g3009. [Medline]. [Full Text]. Leung DY, Sampson HA, Yunginger JW, Burks AW Jr, Schneider LC, Wortel CH. Effect of anti-IgE therapy in patients with peanut allergy. N Engl J Med. 2003 Mar 13. 348(11):986-93. [Medline]. Schatz M, Zeiger RS. Allergic disease during pregnancy: current treatment options. J Resp Dis. 1998. 19:834-42. Busse WW, Coffman RL, Gelfand EW, et al. Mechanisms of persistent airway inflammation in asthma. A role for T cells and T-cell products. Am J Respir Crit Care Med. 1995 Jul. 152(1):388-93. [Medline]. Centers for Disease Control and Prevention (CDC). Compressed Mortality File, CDC WONDER. Atlanta, Ga: CDC; 2006. Cockcroft D, Davis B. Direct and indirect challenges in the clinical assessment of asthma. Ann Allergy Asthma Immunol. 2009 Nov. 103(5):363-9; quiz 369-72, 400. [Medline]. Grant EN, Lyttle CS, Weiss KB. The relation of socioeconomic factors and racial/ethnic differences in US asthma mortality. Am J Public Health. 2000 Dec. 90(12):1923-5. [Medline]. Haahtela T, Lindholm H, Björkstén F, Koskenvuo K, Laitinen LA. Prevalence of asthma in Finnish young men. BMJ. 1990 Aug 4. 301(6746):266-8. [Medline]. Johansson-Lindbom B, Borrebaeck CA. Germinal center B cells constitute a predominant physiological source of IL-4: implication for Th2 development in vivo. J Immunol. 2002 Apr 1. 168(7):3165-72. [Medline]. Keeley DJ, Neill P, Gallivan S. Comparison of the prevalence of reversible airways obstruction in rural and urban Zimbabwean children. Thorax. 1991 Aug. 46(8):549-53. [Medline]. Kepil Özdemir S, Yilmaz I, Aydin Ö, Büyüköztürk S, Gelincik A, Demirtürk M, et al. Immediate-type hypersensitivity reactions to proton pump inhibitors: usefulness of skin tests in the diagnosis and assessment of cross-reactivity. Allergy. 2013 Aug. 68(8):1008-14. [Medline]. Mazzoni A, Young HA, Spitzer JH, Visintin A, Segal DM. Histamine regulates cytokine production in maturing dendritic cells, resulting in altered T cell polarization. J Clin Invest. 2001 Dec. 108(12):1865-73. [Medline]. Miossec P, Korn T, Kuchroo VK. Interleukin-17 and type 17 helper T cells. N Engl J Med. 2009 Aug 27. 361(9):888-98. [Medline]. Nelson HS. Immunotherapy for inhalant allergens. Adkinson NF, Bochner BS, Busse WW, Holgate ST, Lemanske RF, Simons FE. Middleton's Allergy Principles and Practice. 7th ed. Philadelphia, Pa: Elsevier; 2009. Vol 2: 1672-3. Novalbos A, Sastre J, Cuesta J, De Las Heras M, Lluch-Bernal M, Bombín C. Lack of allergic cross-reactivity to cephalosporins among patients allergic to penicillins. Clin Exp Allergy. 2001 Mar. 31(3):438-43. [Medline]. Platts-Mills TA. The role of immunoglobulin E in allergy and asthma. Am J Respir Crit Care Med. 2001 Oct 15. 164(8 Pt 2):S1-5. [Medline]. Strachan DP, Wong HJ, Spector TD. Concordance and interrelationship of atopic diseases and markers of allergic sensitization among adult female twins. J Allergy Clin Immunol. 2001 Dec. 108(6):901-7. [Medline]. Weber RW. Immunotherapy with allergens. JAMA. 1997 Dec 10. 278(22):1881-7. [Medline]. Wilson AM, Haggart K, Sims EJ, Lipworth BJ. Effects of fexofenadine and desloratadine on subjective and objective measures of nasal congestion in seasonal allergic rhinitis. Clin Exp Allergy. 2002 Oct. 32(10):1504-9. [Medline]. Xystrakis E, Boswell SE, Hawrylowicz CM. T regulatory cells and the control of allergic disease. Expert Opin Biol Ther. 2006 Feb. 6(2):121-33. [Medline].